Here’s a map of the countries on the planet of Drisije and their colonies and territories. As always, you can click on the picture to see it larger. 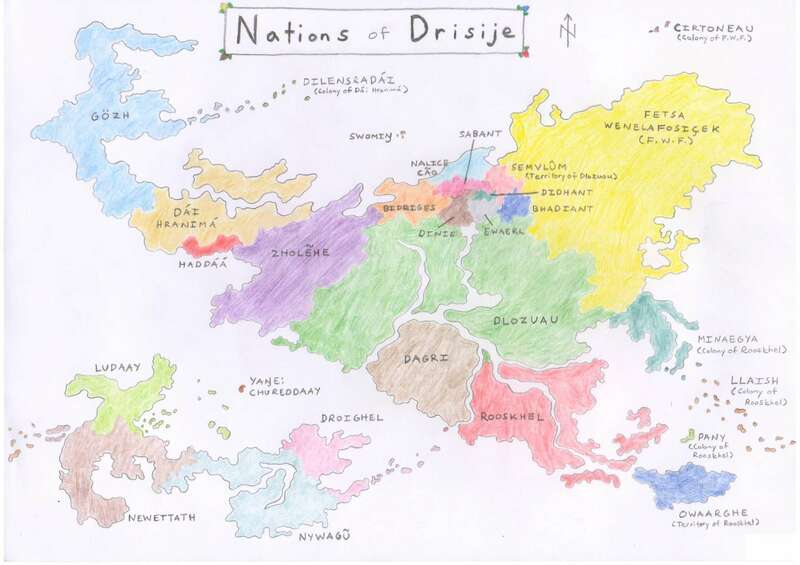 Drisije is still very much a work in progress, but I do know a few things about the nations I’ve drawn here. Rooskhel (in the southeast) is the first place that humans settled on Drisije, and it used to be the head of an empire that encompassed Droigel and Dagri as well as the areas that are still Rooskhel’s colonies. Now, however, Rooskhel is more of a crumbling bureaucracy, eclipsed by more industrialized nations like Dlozuau and Fetsa Wenelafosiçek (which I’ll just call F.W.F. from now on for obvious reasons). Speaking of Dlozuau, it’s probably the most powerful country at the moment in Drisije, though don’t let its size fool you – most of that land is just hot, wet swampland. But those swamps hold a lot of peat that Dlozuau burns to power drainage systems and factories to support large cities. Dlozuau was originally settled by people outcast from Rooskhel for misuse of their magical powers, and there’s historically been a lot of tension between these countries. It’s rarely turned into outright war, however, because both countries rely on exports from each other. Farther to the north, F.W.F. 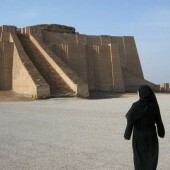 is another deceptively large country – it’s really mostly barren deserts and mountains. Like Dlozuau, it was settled by people who took issue with Rooskhel’s policies on magic. In F.W.F.’s case, however, the settlers were against any magic use at all; their religion teaches against it. But thanks to this same religion’s emphasis on hard work and a wealth of natural deposits of stone, gems, and valuable minerals, F.W.F. has wound up doing pretty well…though there are the occasional outbreaks of religious conflicts or war with Dlozuau (Dlozuau wants F.W.F.’s natural resources but F.W.F. doesn’t want to trade with people that are so liberal with magic use). In central northern Drisije, most of those small countries are made up of former citizens of Dlozuau and F.W.F. who are divided by religion and politics; the citizens of all those countries are more or less the same ethnicity, they just disagree about how a government should be run. In the east, Dái Hranimá, Haddáá, and (a little more south) Ludaay all used to be one country and still speak closely related languages (as is evident in their names). The last of the countries I know much about is Gözh. It’s actually not really one country; it’s a territory populated by a variety of settlers and small communities but without any one government regulating it all. Because it’s so far north, and because Drisije has no seasons, most of Gözh is frozen or at least very cold all year round. Modern technology has made it a bit easier to grow food and stay warm there, but it’s still not an easy place to live. Nevertheless, many people from all over Drisije have chosen to move there rather than stay in their old countries. I think that some people in Gözh may also have magic different from the usual Drisijan magic, but I’m not sure yet. As for all those other countries – well, I just don’t know much about them yet! I’ll have to see what my brain comes up with. This entry was posted in Enter Sheesania, Maps. Bookmark the permalink.